NASA's Earth Observatory web site saw the same Bloom from space. Link "Swirling clouds of blue and green lit the Atlantic Ocean west of Ireland on June 2, 2006, when the Moderate Resolution Imaging Spectroradiometer (MODIS) on NASA’s Aqua satellite captured this image. The ocean is normally black in true-color, photo-like satellite images such as this one, but a large phytoplankton bloom lent the water its brilliant blue and green hues. 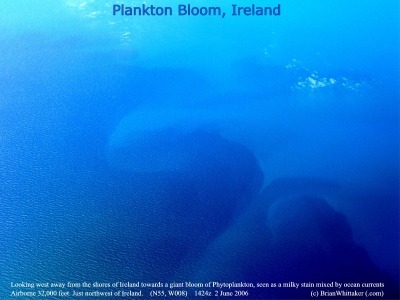 Phytoplankton are microscopic plants that grow in the sunlit surface waters of the ocean. When enough of the plants grow in one place, the bloom can be seen from space."